Last week, I thought about old things. Our culture isn't particularly interested in old things. Just take a look at the landfills. I thoroughly enjoy reclaiming old stuff to use in new and different ways; repurposing, upcycling, and recyling are all my bag, baby. 1. I bought an old sweater from Goodwill that was obviously crafted by a person, not a factory. I love the idea of buying homemade items from the thrift store. It's nice to buy an item that was never in the mainstream stream of commerce, something that didn't come from China. 2. I finally started reading an old book I have been carrying around for the last few weeks. 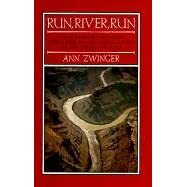 I bought this book, "Run, River Run," from the Denver Public Library when I worked at the Library Cafe a few years ago. It is a memoir of a naturalist's journey down the Green River. I decided to research a bit about the book and found out that the author lives in Colorado Springs, my hometown, just down the road, and that she sometimes teaches courses at Colorado College. She wrote "Run, River Run" in 1971. So, now, I'm really excited to read this book and to hopefully speak to her about it when I'm done. I'd like to do an "old book" review on my blog and I hope she'll let me interview her. I've added the book to my book carousel (on the main page,) if you'd like to check it out. 3. I made a pet bed for my little dog from our old t-shirts. It took six t-shirts and a couple of hours to make. It's honestly a little small for her. So, she crushes the sides down a little. I still have to make a soft pillow. But she likes to lie on it as it is. I plan to make another bigger bed for her, then I'll stick this one in her kennel. I can't wait for my new hat to come! I'll model it for you and post the pic, too.